This is a statue of Dr Karl Lueger (1844-1910), the Mayor of Vienna between 1897 and 1910. Lueger was a well-known antisemite and was a major influence on the thinking of Adolf Hitler. The future Führer lived in Vienna during the Lueger years and described Lueger as the most powerful German mayor of all time. 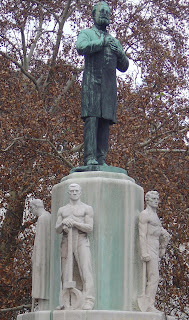 The statue was erected in 1926 and today dominates a square named after Lueger in central Vienna. But not everybody is happy about Lueger's prominent place in contemporary Vienna. Now moves are afoot to redesign the statue and the surrounding square to turn it into a memorial against antisemitism and racism (http://en.luegerplatz.com/index.html). Submissions for a redesign of the square are currently open. But the proposal is not without controversy. Michael Häupl, the current Mayor of Vienna, has ruled out a redesign of the square and would prefer an explanatory plaque on the statue. Across Europe during the last twenty years (since the end of the Cold War) many streets, squares and avenues have ben renamed. In the case of Leningrad the whole city was renamed, back to prerevolutionary St. Petersburg. The end of World War II saw a similar rebirthing as countless Adolf Hitler squares and streets were renamed. As much as such rebadgings are understandable, they do, of course, represent a form of historical revisionism. Nobody would want to live in Adolf Hitler Square today. But cases such as Lueger are less clear. He was nowhere near as extreme in his views as the younger Hitler. Many other past national heroes and local identities throughout the world have histories and had views that are no longer acceptable. While we need to warn against racism in all its forms, pretending that it did not exist in the past (and does not continue to exist) is not the solution. In the case of Lueger, a new square and monument against racism would be better. That would allow us to acknowledge the past while charting a more positive and egalitarian future.